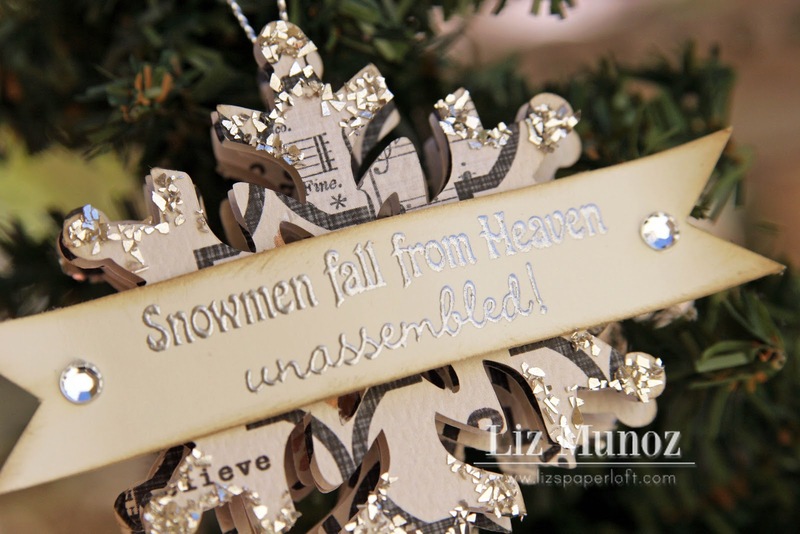 Liz's Paper Loft: 3D Wednesday ~ Snowflakes from Heaven! 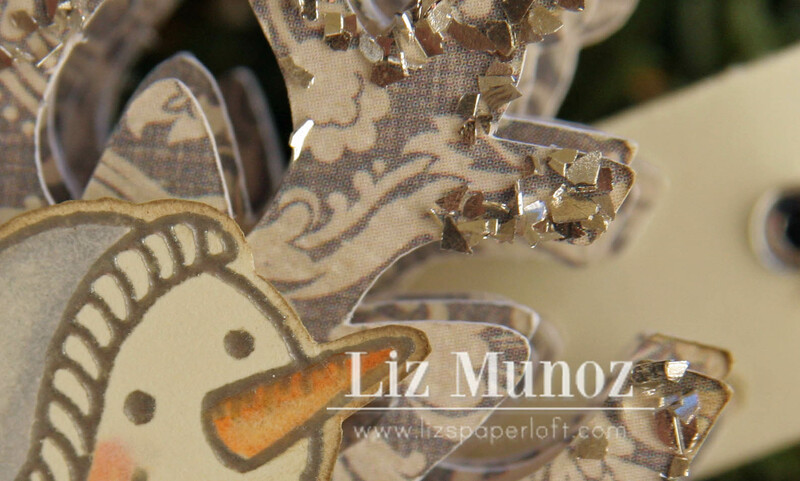 This is the backside, cutting the snowflake on a doublesided paper makes it beautiful on both sides! Sorry there's a bit of glare from the embossing. I put one pop dot in the center in between the layers. I love the side view too! Beautiful Liz!! I love the layers and the light snowy colors! Beautiful with the glitter on the edges and the silver embossing!! This is gorgeous Liz!!!! LOVE the soft colors and that glitter is awesome!!! Absolutely gorgeous!!! I need that glass glitter! When are you getting it back in the store? The stamped details on the snowman that look so pretty with the embossing! Your ornament just received the fabulocity award wow it's gorgeous beyond words. Your talent is amazing. Gorgeous ornament! 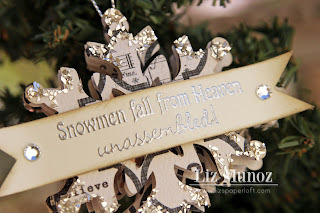 Love that your layered the snowflakes, great embossing! Thank you for sharing. Liz ~ Oh my goodness! This is just GORGEOUS!! 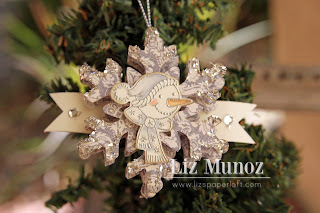 I LOVE ALL the layers of the snowflake!! Did I say LOVE?? I mean it!! That snowman is just too CUTE too! Heat embossed is just PERFECT! Oh GREAT idea to do double sided paper too ~ which you know I LOVE! The glass glitter looks so BEAUTIFUL on this! I have to say I LOVE the non traditional colors you have been using lately ~ STUNNING!!! Beautiful ornaments I love the dimension the glass glitter adds. Gorgeous ornament Liz! Great dimension! love it!! this is awesome! This is b-e-a-utiful! Love the shape and that snowman is the cutest! Oh and the embossing...it's like picture perfect! 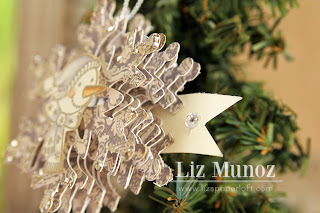 I love this beautiful ornament!!! Wow!!! I will be giving this a try since seeing how beautiful your is! Beautiful job on your ornament! Clever idea to pop 5 layers together...very stunning!